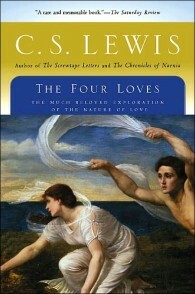 Few books reward close reading—and rereading and reading yet again—as richly as does C. S. Lewis’s The Four Loves. Each of the “four loves”—affection, friendship, Eros, and charity—has fallen on hard times in our modern world, something Lewis had begun to recognize as he wrote the four essays some five decades ago. For example, the topic of “friendship in a digital age” is becoming an increasingly common topic of conversation. Alone Together: Why We Expect More from Technology and Less from Each Other by MIT Professor Sherry Turkle was published in January 2011. More recently, a profound reflection on the state of friendship in our digital age was written by William Deresiewicz, author and former English professor at Yale University. Friendship is devolving … from a relationship to a feeling—from something people share to something each of us hugs privately to ourselves in the loneliness of our electronic caves, rearranging the tokens of connection like a lonely child playing with dolls. We possess each friend not less but more as the number of those with whom we share him increases. In this, Friendship exhibits a glorious ‘nearness by resemblance’ to Heaven itself where the very multitude of the blessed (which no man can number) increases the fruition which each has of God. For every soul, seeing Him in her own way, doubtless communicates that unique vision to all the rest. That, says an old author, is why the Seraphim in Isaiah’s vision are crying ‘Holy, Holy, Holy’ to one another (Isaiah 6:3). The more we thus share the Heavenly Bread between us, the more we shall all have. In these excerpts from The Four Loves, the mention of “Charles” is a reference to Charles Williams and “Ronald” refers to J. R. R. Tolkien. The Four Loves may be purchased here and is available online here. “Faux Friendship,” by William Deresiewicz, was published in The Chronicle of Higher Education.